What Do We Mean by Voice of the Customer? With the evolution of consumer marketing and customer research terms change their meaning. One term that continues to be bandied about to the point it is no longer clearly defines is Voice of the Customer (VoC). VoC is an essential part of customer research, but the term has become a catch-all for any type of customer experience or interaction. There are parameters around how to define and think about VoC that are important to appreciate to develop an effective customer research program. The Voice of the Customer is an old concept. Organizations have been taking the pulse of the people for generations. Steve Allen started the concept of the Man on the Street interview for the old Tonight Show back in the 1950s, doing impromptu interviews to hear the vox populi. Getting people’s opinions can be powerful and provide valuable insight into the perception of your brand or product. VoC actually began as a means to gather information as part of product development. The goal was to gather information from target consumers to determine their wants and needs. VoC was a means of capturing insight about customer requirements in a hierarchical manner in order to make the information actionable, i.e. give the product team an understanding of how to develop the right features and functions. What has happened over time is that the definition of “voice of the customer” has expanded beyond its original, narrow definition to support market research. VoC assessment has become part of consumer research methodology and is used to identify customer needs, trends, behaviors, and patterns. What’s important to remember is that VoC research is designed to address the customer experience BEFORE there is physical interaction with the product or brand. Once the customer has had the product experience, then you move into a different phase or research based around customer feedback. Strive to understand the customers’ expectations from the brand as part of your research. 2. Understand how VoC helps shape a brand’s product or service to align with the customers’ needs. 3. Understand how the brand can address the demands of the customers, as opposed to how the customer perceives the product or service. 4. How can VoC expectations be applied to bring about strategic changes across the organization. 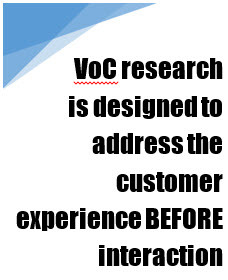 VoC research is designed specifically to learn more about customers’ likes, dislikes, preferences, and patterns. By its nature, VoC research is anticipatory, and requires interviewees to project themselves into the brand experience and voice their expectations. An IVR surveys can be an invaluable tool for VoC research if it is applied properly. This is especially true of newer VoC systems that integrate voice driven IVR surveys that actually capture and auto transcribe the open-end responses of customers, giving researchers detailed qualitative information about customer attitudes and emotions. Not all customer research touchpoints fall into the category of VoC, but if you are using customer research to assess customer expectations or acceptance of a new product or brand experience then you should plan your VoC research accordingly.